Relax the BODY, MIND & SOUL! Mildly foaming, fragrant bath oil formulae blended especially for use in Whirlpool and Air-Spa baths............with 3% Essential oils! 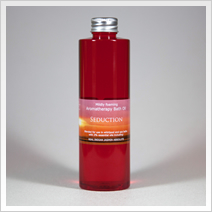 Absorption - The bubbling action of a whirlpool bath softens the skin and opens the pores enabling the body to easily absorb essential oils. Inhalation - The millions of bubbles created by the whirlpool system carry small molecules of the oil gradually rise to the surface where they are transformed into a steamy vapour just above the water. 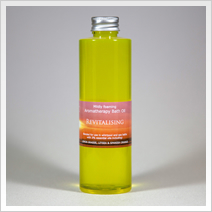 The bather benefits by inhaling this aromatherapy vapour rich in essential oils. Relaxation - The gently swirling waters of a hydro-massage system relax muscles and ease away the aches, pains, stresses & strains of the day. This promotes a sense of well being and sound sleep which in turn creates a relaxed body & mind on which the essential oils can work to maximum effect. No medical claims are made for the use of this product. Use within 3 months. of purchase. Not Tested on Animals Caution: Do not use if pregnant. Keep concentrate away from eyes, mouth, children and pets. New size contents now 200ml. In accordance with our policy of continual product improvement we reserve the right to amend product specifications without prior notice. Below is our full selection of low foaming, fragrant whirlpool bath aromatherapy oils. 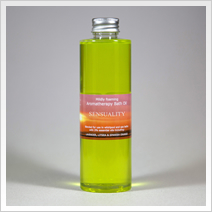 Each individual oil has been blended for each specific personal use. We have a complete & vaied range for you to choose from for your whirlpool bath. 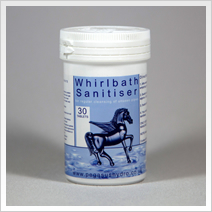 Remember, you will get one in the free starter pack we send you when you order your Pegasus Whirlpool Bath. No medical claims are made for this product. Use within 3 months. Not tested on animals. Caution do not use if pregnant. Keep concentrate away from eyes and mouth. Taking care of your Pegasus Whirlpool Bath is important & does require a little attention for you to maintain them so they sustain the level of performance they had the day they left our craftsmens accomplished hands. Below are two products that we strongly reccomend you regularly use to help keep your Whirlpool bath in perfect working order for years to come. 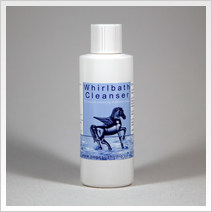 For regular cleansing of whirlpool pipework. Use every four to six weeks. 1. Simply fill the bath with warm water add the contents and with the air controller closed switch on the whirlpool for 10-15 minutes. 2. Drain the bath and rinse thoroughly. Only use in accordance with the manufacturer's directions. 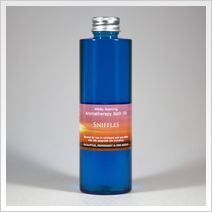 For regular sanitizing of the whirlpool bath. 1. After each use of the bath and before emptying, simply put one tablet into the bath water. 2. Switch on the system and let it run for 2 to 3 minutes. 3. Switch off the sytem and let it drain as normal.